Calfee’s Real Estate Litigation practice provides public and privately held companies with experienced representation in large-scale, complex litigation involving real property disputes. Our attorneys have extensive experience in enforcing the rights of commercial property owners, investors and trustees and defending real estate developers. We also are experienced in the prosecution and defense of major commercial real estate foreclosure and receivership proceedings involving virtually every type of commercial property imaginable and in commercial landlord-tenant repossession and other leasehold litigation issues. Calfee has represented numerous property owners in tax revision proceedings before county boards of revision and The Ohio Board of Tax Appeals. Our litigators routinely represent owners and others in litigation involving eminent domain, zoning, partition and mechanic’s lien issues. We also provide plaintiff and defense counsel for litigants in disputes regarding title and ownership to property including, but not limited to, adverse possession, easement by prescription, possessory interests, and claims to title. Calfee’s Real Estate attorneys also counsel plaintiffs and defendants in litigation regarding actions to enforce rights against title insurance companies. Additionally, our litigators’ experience includes negotiating issues of fees on the sale of property based on land development as well as working with non-profit land development groups. 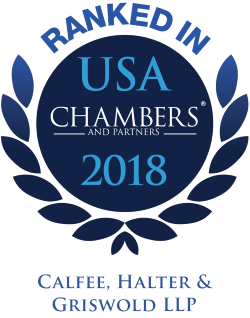 Calfee’s Litigation group was selected for inclusion in the 2019 "Best Law Firms" rankings by U.S.News – Best Lawyers in America in Real Estate Law and several Litigation practice areas.